I just finished my blog post on Android patent suit no. 38 (which also targets RIM and Microsoft), and then found out about the next smartphone suit that claims patent infringement by Android (also other platforms, but most of the devices mentioned in the complaint are Android phones). When will this ever end? A Texas-based company named H-W Technology L.C. filed a complaint in Northern Texas yesterday, asserting US Patent No. 7,525,955 on an "Internet protocol (IP) phone with search and advertising capability" against 32 legal entities. The patent holder claims that the patent covers systems and methods that "allow users of [smartphones] via domain specific applications to receive information and offers from merchants and to complete a transaction with one of said merchants without having to generate a voice call." What's really disconcerting about this lawsuit is that it's the first such lawsuit to attack -- besides operating system vendors and device makers, which are routinely sued by patent holders -- a number of companies because of their smartphone apps. I'm really afraid we're now going to see more patent lawsuits against application developers. Hopefully this won't ever affect little guys who can't afford to defend themselves, but if there's a major company behind an app, or if an app is commercially very successful, it can happen and it has now apparently started to happen. Google and Microsoft are sued for providing software that is installed on smartphones. With respect to Microsoft, the Windows Phone 7-powered Samsung Focus is mentioned. In Google's case, the Android application store is mentioned. Device makers: specifically named products include the iPhone, the BlackBerry Torch, and five Android devices (LG G2x, Samsung Galaxy S, Motorola Droid X, HTC Thunderbolt, and Kyocera Echo). All of the accused apps are basically mobile online shops: Amazon.com's, eBay's, Hotels.com's, Expedia's, Priceline.com's, Orbitz Worldwide's and Kayak.com's apps, and Verizon's VCast app. The complaint is relatively long because it has to handle a long list of defendants (32 legal entities; I summarized them in the above list because in some cases there's more than one legal entity named in connection with the same brand name). I can't say I'm impressed with the complaint. For example, Nokia and Sony Ericsson are also named as defendants but I couldn't find any accused products from those companies in the complaint. But like I said before, this is a "first" in the sense that companies are sued over a patent that allegedly reads on their smartphone apps. Two days ago I just reported on an ITC judge's "final initial determination" (not a definitive ruling) to dismiss a complaint filed by Nokia against Apple over 7 patents back in December 2009. I also updated my battlelines diagram. Now the next update is already due: Nokia just filed another ITC complaint against Apple over seven patents -- and a complaint (over six of those seven patents) with the US District Court for the District of Delaware. Today Nokia issued this press release. It's the most aggressive one Nokia has issued in this dispute, and probably the most aggressive one since its epic battle with Qualcomm. In its headline, Nokia "[a]lleges Apple infringes additional Nokia patents in virtually all products". The first paragraph of the announcement describes that product range as "virtually all of its mobile phones, portable music players, tablets and computers." Nokia's lists of accused products for the various patents are interesting. When the iPhone is named, some patents are claimed to be infringed by "at least Apple's iPhones for the AT&T network" and others by "at least Apple's iPhones for the Verizon network." According to Nokia, the seven patents-in-suit relate to inventions "in the areas of multi-tasking operating systems, data synchronization, positioning, call quality and the use of Bluetooth accessories" (more details on the patents further below). Paul Mellin, Nokia's intellectual property VP, stresses Nokia's role as a pioneer by stating that "many [of those patents were] filed more than 10 years before Apple made its first iPhone." It's actually not new for Nokia to attack a host of Apple product lines simultaneously. If you look at my reference lists on the previous complaints Nokia and Apple filed against each other (pages 24 to 34 of this document), you can see that Nokia already did this on other occasions. Some examples: page 27 contains a matrix that shows Nokia's first ITC complaint already accused products from the iPhone, iPod, Mac and MacBook lines. On page 31, you can find a similar table for a complaint that related to different iPhone, iPad, iPod and MacBook products. It's not a coincidence that Nokia takes this step so shortly after Friday's unfavorable determination. Preparing such a complaint always takes time, but Nokia probably knew it had an unfavorable determination coming, and Nokia must have been searching for some time for patents that it can assert against Apple. If you already know which patents you wish to assert against which products and have the claim charts (tables describing the language of the patent claims and the relevant characteristics of the allegedly infringing products) in place, you can also put together a complaint within a few days. We haven't yet seen the end of this. 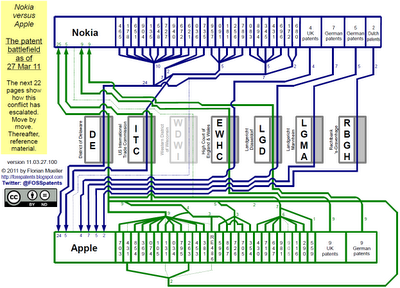 If Nokia wants to, it can probably bring many more patents into position against Apple. I'm sure Apple also has the potential to make some more allegations, but at some point Apple will run out of patents that Nokia needs. I can very well understand Apple's perspective. Apple looks at the innovative breakthroughs it achieved in recent years -- a period during which Nokia was poorly managed. But Apple has always and especially recently been a proponent of a strong patent system, and you just can't have your cake and eat it. Those patents are valid for up to 20 years, a long time in this industry. It's the name of the game that patents give a pioneer like Nokia a strategic advantage over a late entrant like Apple. There are no signs of Nokia trying to drive Apple out of business with its patents: between two players of that kind, destruction would be mutually assured. The question simply comes down to who will be the net payer. Nokia appears to be very convinced that it brings the more powerful patent portfolio to the table. Strategically, Nokia would have a lot to gain from requiring Apple to take a royalty-bearing license. As I mentioned in my previous post, Nokia's management plans to monetize the company's patent portfolio more proactively now. Even if Nokia couldn't charge Apple royalties, it could probably still find many others in the industry who are weaker than Apple and have to pay. But if Nokia can show that it has the strength and the determination to bring Apple to its knees, most other device makers will think very, very hard before ever picking a fight with those Finns. This is a total power play. I will soon update my visualization of the battlelines. US Patent No. 7,209,911 on "synchronization of databases using filters"
US Patent No. 6,212,529 on (again) "synchronization of databases using filters"
US Patent No. 6,141,664 on "synchronization of databases with date range"
US Patent No. 6,445,932 on a "multi-service mobile station"
US Patent No. 5,898,740 on a "power control method in a cellular communication system, and a receiver"
US Patent No. 7,319,874 on a "dual mode terminal for accessing a cellular network directly or via a wireless intranet"
Nokia asserts the three database patents (the three first ones on the list) specifically against "Apple's iPhones for the AT&T network, iPads, iPod Touches, and MacBook, MacBook Pro, and MacBook Air computers". The fourth patent ('932) is asserted against that same list except the MacBooks. The fifth and sixth patent are asserted against "the Apple iPhone 4 for the Verizon network". While no platform faces as many patent infringement assertions as Android (37 Android-related patent lawsuits have been filed since March 2010), the most extensive battle between any two smartphone companies is still Nokia vs. Apple. I blogged about this dispute most recently in early January after Apple scored a procedural win. On Friday, the Administrative Law Judge investigating Nokia's ITC complaint against Apple made a "final initial determination" according to which Apple was not found to infringe any valid Nokia patent claims. This was reported by Reuters ("Apple wins skirmish in Nokia patent war") and Bloomberg ("Apple Wins Trade Ruling in Nokia Patent Fight Over Phones"). It's important to put this into context. The "final initial determination" is not yet a final ruling; and in any event, Apple and Nokia are fighting each other in half a dozen venues of which the ITC is a particularly important one, but not the only one. There is a significant probability now that Nokia and Apple may play out a "goalless draw" at the ITC, in which case the attention will shift to the US District Court for the District of Delaware and, even sooner, to Europe. Furthermore, Apple's assertions against Nokia relate (almost entirely) to phones running the Symbian mobile operating system, but Nokia is going to increasingly bet on Windows Phone, a platform that Apple is extremely unlikely to attack. Nokia's choice of Windows Phone has probably already changed the calculus of the parties. The corresponding PDF document is available on Scribd.com. It shows the 22 procedural moves that led to the current situation, and contains detailed reference lists of the lawsuits, parties, asserted patents and accused products. On Scribd you can also find a collection of documents related to the smartphone patent lawsuits. In October I explained the role of the US International Trade Commission as a patent enforcement agency. Back then I already mentioned that USITC decisions can be appealed to the Court of Appeals for the Federal Circuit (CAFC). An appellant can request a stay of an import ban, which happened (just for an example) in a dispute between Broadcom and Qualcomm. But even the ITC itself is not yet done with Nokia's complaint against Apple. The Administrative Law Judge (ALJ) in charge of this investigation made his "final initial determination", and he's unconvinced of any infringement of valid Nokia patent claims by Apple. By coincidence, a decision related to another dispute was announced on the same day: Kodak's complaint against Apple and BlackBerry maker Research In Motion had also failed to convince the ALJ in charge of that case, but the Commission, the ITC's highest-level decision-making body (which has six members), decided to review that "final initial determination". It may now decide in Kodak's favor, against the ALJ's determination, as Bloomberg and Reuters reported. Until the Commission itself has decided, fortunes can change at any stage of an ITC proceeding, as I told Tech.Fortune.CNN.com in my first reaction to Friday's announcements. This has consistently been my take regardless of who's on the supposedly winning or losing side. Five months ago, at an earlier procedural stage, there was a negative staff recommendation concerning some of Apple's claims against Nokia. At the time I also cautioned everyone that it was far from a definitive ruling. Anything is still possible at the ITC in the three investigations involving Apple and Nokia. Nokia may still have a Kodak moment and get a review of the ALJ's determination by the Commission. Even if Nokia's complaint against Apple was dismissed definitively by the ITC, Apple's assertions against Nokia may very well suffer the same fate. Friday's determination related to five Nokia patents. Nokia had originally asserted seven, but it dropped two of them during the process. Apple initially asserted nine patents against Nokia. At this stage, only five of them are still in the game. Most recently, Apple dropped a patent from its complaint. The motion for partial termination was filed on February 22, 2011, and granted on March 1, 2011. Previously, Apple had dropped three other patents asserted against Nokia. You can find the details by clicking through the aforementioned step-by-step slideshow I uploaded to Scribd. That document also lists the asserted patents and indicates which ones were withdrawn (and when). The five Apple patents still in the game include one patent asserted against both Nokia and HTC (the related investigation names both companies as defendants, following a consolidation decision), and four patents asserted against Nokia but not against HTC. And those four patents are the ones about which I said in the previous paragraph that the ITC staff issued a negative recommendation. So in the event the final ITC decision is consistent with the staff recommendation (which it may or may not be), and if the one patent that is asserted in the investigation that additionally involves HTC, then Apple may not obtain an import ban against Nokia either. Should there really be a "goalless draw" at the ITC, and should the parties continue to fight each other instead of settling, then they will both try to win decisions in other fora, where it will take longer than in those ITC investigations, but not much longer. In two weeks -- on April 13, 2011 -- the ITC will start another hearing in investigation no. 337-TA-704 (four Apple patents), with an initial determination scheduled for June 24, 2011, and a ruling for October 24, 2011. On April 18, 2011, the hearing in investigation no. 337-TA-710 (which is mostly about HTC but one remaining patent is also asserted against Nokia) will begin. The initial determination in that investigation is scheduled for August 5, 2011, and the ruling for December 6, 2011. In the investigation that gave rise to this post -- investigation no. 337-TA-701 of a Nokia complaint against Apple -- the ALJ made his Friday determination one week ahead of schedule. When the schedule was set on May 6, 2010, the ALJ already indicated that the initial determination could be issued ahead of time, and mentioned the possibility that the final ruling could then also be moved up accordingly. For now the final ruling is scheduled for August 1, 2011, but it could now come a week earlier than that. There are three cases in the US District Court for the District of Delaware. In each one, there are claims by Nokia and counterclaims by Apple. One of the Delaware cases -- the second one to be filed -- contains only such claims that correspond to the parties' ITC complaints. That case was stayed for the duration of the ITC investigations. Whenever it may be resumed, it will take a while before any decision gets taken. The original Delaware case is rather complex because it involves patents related to which Nokia had made a FRAND licensing commitment. This complexity is reflected by the fact that three different jury trials are needed to resolve that case: one on patent infringement claims, one on contract matters, and one on antitrust issues. The patent trial is scheduled to begin on May 21, 2012; the contract trial, on June 18, 2012; and the antitrust trial, on October 1, 2012. The third Delaware case was originally filed in Western Wisconsin. If it had not been transferred, the trial would have started on January 9, 2012, but as a result of the transfer, it is virtually certain to be pushed back by at least several months. The Delaware court has not yet ordered a new schedule. On September 9, 2011, the Rechtbank (Dutch court) at The Hague will hold a hearing on Nokia's complaint against Apple. While the Netherlands is a small country, it is home to Europe's largest seaport, Rotterdam. Depending on what role Rotterdam plays in Apple's European (or even worldwide) logistics, a decision there could have more or less impact. Sony recently experienced temporary problems up there. 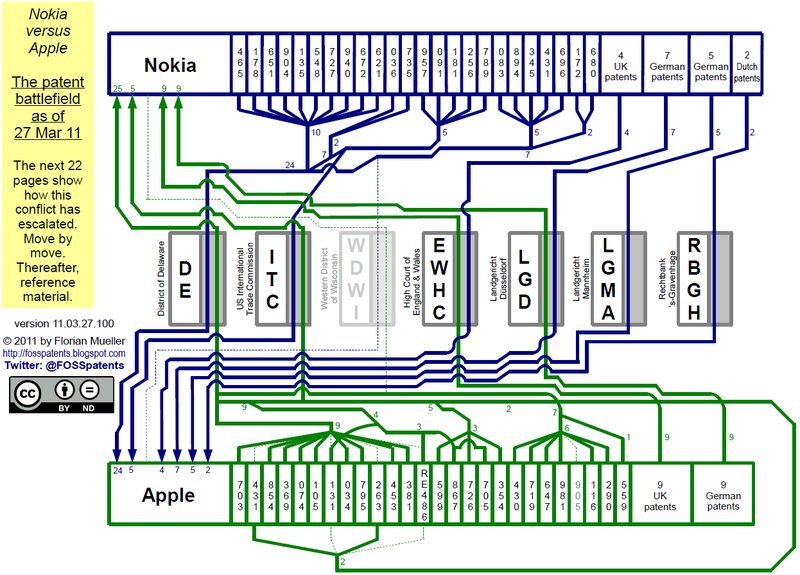 The District Court of Dusseldorf, Germany, received complaints from both Apple and Nokia, and it decided to actually look at each of the 16 patents in a separate case. The hearings in those cases will take place between January 26, 2012, and April 17, 2012 -- still before the first Delaware trial. Settlement: this year, next year, or even later? It's obvious that those two large players will have to settle their dispute at some point. I believe that Nokia's decision to adopt Windows Phone should actually make this easier: there's less for Apple to gain by pursuing Symbian, and there's less for Nokia to lose. But Nokia's CEO has ambitious plans for the monetization of his company's patent portfolio and may not give up until it gets Apple to pay. I thought that the prospect of ITC import bans -- even though they can be appealed and stayed -- was going to put some pressure on both parties to reach an agreement. However, at this stage either one can hope that no such ban will be ordered. Things aren't looking too good for either company's ITC complaints. Then they may decide to wait until some decisions in Europe, and possibly until Delaware. And there could be second instances in any of those cases, which would further delay any resolution of the dispute. For independent observers like me, this patent war is fascinating to watch. It's a clash of titans, a fight between a mobile phone pioneer and a major smartphone innovator. It pits the market leader by revenues against the market leader by units. All of this is exciting, but the two organizations should free up resources with a settlement in order to better focus on other pressing issues in this rapidly-evolving market. With yesterday's patent infringement suits filed by Microsoft against Barnes & Noble, Foxconn and Inventec with a US district court and the ITC, the total number of Android-related patent lawsuits has reached 37. Yes, thirty-seven. More than three dozen. Hard to believe but true. Just to avoid misunderstandings, there are some disputes that consist of multiple lawsuits. For example, I previously published visualizations of such disputes as Apple vs. HTC/Motorola and Microsoft vs. Motorola, each of which consists of a number of suits. Now I have -- with a little help from a friend who's good at graphics design -- created a chart that shows how lawsuits involving Android have exploded since last year. If you click on the graphic shown further above, you can see it in full size. I have also created a PDF version that you can download from Scribd if that's your preferred format. Obviously, Android's market share plays a certain role. But that's only a part of the explanation. Other computing platforms in history were far more popular and didn't create such a massive intellectual property problem for their commercial adopters. In my previous blog post I raised the question of whether Google manages intellectual property matters diligently and respects right holders. For example, the way Google habitually "launders" software published under the GPL (open source license) for its purposes baffles me. The relevant version of the GPL -- GPLv2 -- has been around since the early 1990s, and Google is the first commercial operator to believe that a program can just cut out the copyrightable parts and deprive GPL'd software of all protection. A company that treats copyright this way -- also according to Oracle's allegations -- may be similarly arrogant and reckless when patents are concerned. Google just exposes its entire ecosystem to legal risks. If it goes well, Google reaps most of the rewards. If it doesn't, others will have to pick up most of the bill. Google's own patent portfolio is, as I explained in January, far too weak for what's undertaken in connection with Android. While a company's own patent portfolio can't deter non-practicing entities (sometimes also called "trolls") from suing, it is at least very helpful in order to reach cross-license agreements with other major IT companies. Google is unable to do that. This is a serious strategic weakness, and it's in no small part responsible for the Android patent mess. I mentioned that cross-licensing generally doesn't work when the other party is a non-practicing entity. What's required then is inbound licensing. There are patent holders with whom other mobile platform companies previously did license deals, but since Google doesn't seem to be willing to spend money on such arrangements, they go out and sue device makers. This is somewhat related to the point I made before about arrogance, recklessness, and a strategy based on exposing the ecosystem to legal risks. The above list is not exhaustive, but it shows that there are reasons for the current flood of patent lawsuits related to Android -- and Google is definitely responsible for the most important ones of those reasons. Also, Google is not simply a "victim" of patent aggressors. Just today, Google was granted a typical "troll" patent: US Patent No. 7,912,915 ("inventor": Google founder Sergey Brin) on "systems and methods for enticing users to access a web site". That's basically a patent on the idea behind the famous "Google Doodle". If you read the patent document, you can see that there's absolutely no serious innovation behind it. The patent office was apparently hesitant to grant it, but reluctantly did so after Google kept pushing for about a decade. A company that seeks to monopolize such basic ideas -- behind which there really isn't any serious technology -- apparenty loves patents. Even trivial patents (because the Google Doodle patent certainly does nothing to raise the quality of US patent grants). But Google's affection goes only to its own patents. On Thursday I reported on what is very likely a violation of the GPL (the license under which Linux and many other open source programs are published) by Android, Google's mobile operating system in connection with the Linux kernel headers. It sparked a lot of debate, but so far I haven't seen even one explicit denial of the legal theories I tend to subscribe to. No one quoted in the media has claimed affirmatively that Android isn't infringing. On the contrary, I have seen others share my concern. This blog post by an O'Reilly author who calls himself a "US copyright law junkie" is particularly interesting. After the Linux header story, a loyal reader of this blog sent me two links that pointed me to two other examples of GPL "laundering" in Android. This makes three distinct situations where Google has taken affirmative steps to try to remove the GPL effect from its supposedly free software stack. As I've discussed before, those steps are most likely ineffective, but even if they are, they are deeply troubling. The first new example of laundering concerns an Android component I use every day: the Bluetooth stack with which I connect my Android phone to my car's audio system. It's a safe assumption that most if not all Bluetooth-compatible Android devices come with that software module. Google uses the GPL'd BlueZ code as Android's default Bluetooth stack. BlueZ was originally developed by Qualcomm, a company that has previously been a tough enforcer of intellectual property rights (such as against its customer Nokia). Qualcomm already makes money on virtually all Android phones in certain ways, but who knows when it may want more and seek to monetize BlueZ. Since the time BlueZ was GPL'd, other parties will also have contributed to BlueZ's codebase. It could be difficult to work things out with all right holders. The other link I received shows that the header files for the ext4 file system (which was added to Android starting with its Gingerbread, or version 2.3, release) were also laundered. While that file system is part of Linux, this is -- as I'll explain further below -- still a separate issue from the headers that Google cleansed for Bionic. I dug into the commit history of the three known sets of header files that were laundered by Google. I found that many of these header files were added to numerous times by various committers. I have published a timeline of when the Bionic, BlueZ and ext4 headers were first introduced into Android and when those headers were added to or updated. That PDF document is very wide; the best way to view it is to download it from the link I provided and then set the zoom mode to "screen height". Bionic: first "clean headers" added 2008-10-21 (Android Release 1.0). Notable additions of new "cleaned up" headers or updates on: 2008-10-30, 2009-05-27, 2009-06-16, 2009-07-09, 2009-07-16, 2009-08-06, 2009-08-20, 2009-08-31, 2009-10-14, 2010-02-01, 2010-02-02, 2010-02-03, 2010-02-08, 2010-04-07, 2010-06-02, 2010-06-02, 2010-06-23, 2010-07-15, 2010-08-07, 2010-08-16, 2010-08-24, 2010-09-24, and 2010-11-01. BlueZ: first "clean headers" added 2009-03-09.
Notable additions of "cleaned up" headers and updates on: 2009-03-09, 2009-03-09, 2009-12-09, 2010-02-24 and 2010-03-24.
ext4: first "clean headers" added 2010-08-14. It's clear that the question of GPL laundering is not isolated to the Bionic headers, nor can it be considered an isolated incident born of inattentiveness or oversight. This is a clear pattern of extensive GPL laundering by Google, which should worry any manufacturer or developer who cares about the IP integrity of Android and its effect on their proprietary extensions or applications. It should also be of significant concern to those who advocate software freedom. Between the copyright part of Oracle's lawsuit, the very suspect copying of Linux headers and now these most recent discoveries, it's hard not to see an attitude. There's more to this than just nonchalance. Is it hubris? Or recklessness? A lack of managerial diligence? The headers of the GPL'd BlueZ software and of the ext4 file system were apparently put through the same "copyright-cleansing" process as the Linux kernel headers. Google employees claimed in an online discussion that they believe they have been able to work around the GPL for this one, too. This is very worrying for the whole free and open source software universe because it means that this was not at all specific to Linux. It can now happen to any GPL'd program out there, and has happened to more than one GPL'd program already. It reduces the GPL to a farce -- like a piece of fence in front of which only fools will stop, while "smart" people simply walk around it. In the following I'll provide more detail on the BlueZ and ext4 issues. The "BlueZ clean headers" directory: not what I call "clean"
The platform/system/bluetooth.git section of the Android codebase contains a directory called "bluez-clean-headers". The word "clean" is Google's euphemism for "put through a copyright-cleansing process". You can find Google's explanation of the distorted meaning of the word here. That text relates to the Linux headers, but it's the same approach as the one used on BlueZ. It outlines Google's theory why it believes that cutting out comments and some other material does away with copyright -- a position that is highly questionable at best. The short version is that "clean" is a Googlespeak expression for software that is claimed to have been deprived of copyright protection and, as a result, freed from copyleft, a mechanism that is meant to protect free software against proprietization. That "bluez-clean-headers" repository contains only one directory, named "bluetooth". This link leads to its file list. You can read the content of each file by clicking on the word "raw" at the right end of each line. "This header was automatically generated from a Bluez [sic] header of the same name, to make information necessary for userspace to call into the kernel available to Android. It contains only constants, structures, and macros generated from the original header, and thus, contains no copyrightable information." If you compare it to the notice at the start of the repurposed Linux header files (which I published here), you can see that it's the same dubious claim, just that "Linux" was replaced with "Bluez" [sic] and "libc" with "Android". Google will have used the identical script as for the Linux headers, possibly with a different configuration file, or only a slightly modified version of it. One of the six files (the fourth one listed in the directory), l2cap.h, contains the notice of the "cleansed" Linux kernel headers. I checked into it and it is indeed another Linux kernel header that Google uses. It's not part of the set of headers that are added to Bionic, but it's originally a Linux and not BlueZ header. It is, however, needed for this Bluetooth implementation. I am not sure that triviality is a way out of your GPL [obligations]." I also tried to find out whether BlueZ is indeed Android's default Bluetooth stack, and this page leaves no doubt that it is. In this Android source code directory, there are several header files that were generated by putting headers of the ext4 file system through Google's scrubber script. Since its version 2.3 (aka "Gingerbread"), Android uses ext4. In Bionic's case it's certain that each Android device includes the related files; in BlueZ's case, it's a safe assumption that most Android devices supporting Bluetooth come with that stack. But I can't say with certainty that the ext4 headers identified above are part of Android in the form in which it is distributed on devices. They are located in a part of the codebase that's related to debugging and inspection. While ext4 is a Linux file system, it's important to consider that this is not just more of the same in terms of additional files added to Bionic. These headers are distinct from the ones that make it into Bionic. They are from a different part of the Linux codebase: while the headers added to Bionic come from the /linux/include/ section of the Linux codebase, the ext4 headers come from the linux/fs/ section, which is for file systems. That fact sets the ext4 headers apart from headers of which the Linux kernel maintainers offer "sanitized" versions for inclusion in C libraries. This shows that Google's header laundering doesn't seem to stop anywhere. They take whatever headers they want, put them through their script, and claim that those are not copyrightable. And there are over 100 files with express copyright statements and GPL license notices and more than 60 distinct express copyright holders in the original Linux kernel headers that Google "borrowed" for Android. The fact that such notices are added to header files shows that the authors of the programs in question consider the headers copyrightable. Also, without copyright, there's no way to put material under a license such as the GPL. Google cuts out all those notices and replace them with its own "no copyrightable material" notice. It clearly says something that Google is uncomfortable with those notices and sees a need to remove them. In many header files the copyright and GPL notice is the only part to be removed. If, as some have contended, header files are not copyrightable, why bother removing the notice at all? We are no longer talking about one incident. There are three (Linux kernel headers, BlueZ, ext4), there may already be more, and if nothing is done to stop this, there will be many more. I just saw that Microsoft has announced a patent lawsuit against Barnes & Noble, Foxconn and Inventec over five patents allegedly infringed by Android. Barnes & Noble sells the Nook e-book reader. I also read a post on Microsoft's corporate blog that says "Licensing is the Solution" for patent infringements by Android. Microsoft filed a complaint with the US District Court for the District of Western Washington, which I have downloaded from PACER.gov, and one with the US International Trade Commission (ITC). Microsoft lodged complaints against Motorola in the same two fora, and asserted the same patents in both of them. I haven't yet seen the ITC complaint against Barnes & Noble but wouldn't be surprised if the ITC complaint mirrored the federal lawsuit, just like in the Motorola case. [Update] Meanwhile Bloomberg has confirmed that the ITC complaint mirrors the federal lawsuit. There are five patents-in-suit. One of them was previously asserted against Motorola in a counterclaim; the other four patents have not been previously asserted against Motorola, but if they're infringed by Android, then Microsoft could always elect to do so. Given the breadth and depth of Microsoft's patent portfolio, this isn't surprising. US Patent No. 5,778,372 on "remote retrieval and display management of electronic document with incorporated images"
US Patent No. 5,889,522 on "system provided child window controls"
US Patent No. 6,891,551 on "selection handles in editing electronic documents"
US Patent No. 6,957,233 on "Method and apparatus for capturing and rendering annotations for non-modifiable electronic content"
At first sight, five patents may not seem to be a huge number, considering that in some other Android-related suits there are several dozen patents in play. But Barnes & Noble, Foxconn and Inventec will certainly be aware of the list of 23 patents asserted by Microsoft against Motorola (for the latest update on that dispute, read this blog post; there's also a visualization on Scribd). While Barnes & Noble is the first defendant named in today's complaint, the implications of this lawsuit go way beyond just the Nook e-book reader. Microsoft also decided to sue manufacturing companies Foxconn and Inventec. If Microsoft prevails and obtains an injunction (and/or an ITC import ban) against those companies, they will be enjoined from selling any other Android-based products infringing the same patents unless there is a license agreement in place for a given product. According to Wikipedia, Foxconn manufactures devices for many major players, including some well-known vendors of Android-based devices such as Acer, Asus, Dell, Samsung and SonyEricsson. "Last year, HTC took a license covering its Android-based smartphones, confirming the viability of our license-first approach. In the e-reader space, Amazon.com signed a patent license with Microsoft last year covering its Kindle device. And many other device makers have also taken licenses to Microsoft’s patents under a number of existing licensing programs." HTC, Amazon.com and any other licensees compete with Barnes & Noble's Nook. For Amazon.com, Barnes & Noble is a particularly relevant competitor. If Barnes & Noble refused to pay (which is what Microsoft says), it's actually a matter of fairness that Microsoft enforces its patents because otherwise those who respect Microsoft's rights would be at a competitive disadvantage versus non-paying infringers. I would personally prefer for no such patents to be granted in the first place -- but if they exist and are enforced, which is the law of the land, then there must be a level playing field. A lawyer working for various companies paying patent royalties told me last year how important it is that everyone in a given market has to pay royalties or, alternatively, no one. Intellectual property issues continue to cloud Google's mobile operating system. 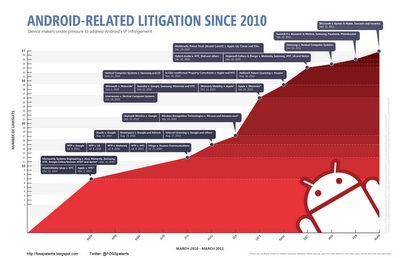 More than a dozen patent suits over Android are already underway. In one of them, Oracle additionally claims that Android infringes on large amounts of copyrighted Java code. And now there is grave concern over the legality of a central element of its architecture: the library that connects Android and its applications with the underlying Linux kernel. Google copied 2.5 megabytes of code from more than 700 Linux kernel header files with a homemade program that drops source code comments and some other elements, and daringly claims (in a notice at the start of each generated file) that the extracted material constitutes "no copyrightable information". It is much more likely that Google is wrong and this is, instead, a very serious violation of the GPL, the open source license under which Linux is published. Google's "no copyrightable material" claim, which plays a central role in enabling this potpourri, is at best questionable. If Google is proven wrong, pretty much that entire software stack -- and also many popular third-party closed-source components such as the Angry Birds game and the Adobe Flash Player -- would actually have to be published under the GPL. In some cases, such as Dalvik, that would be hard to do for technical and licensing reasons, but in any case, a fully GPL'd Android would completely run counter to Google's Android strategy. Everyone would be free to use, modify and redistribute all of the affected software. As a result, there would be no more revenue opportunity for the developers of the affected applications, and the makers of Android-based devices would lose their ability to differentiate their products through proprietary add-ons. Whatever software they publish would become available to their competitors on GPL terms. Prices and margins would inevitably come down. To eliminate the risk of a collapse of the Android ecosystem and navigate around copyleft, the misappropriated Linux code would have to be replaced. The only real viable alternative is a library called glibc (GNU C library). That library is the industry standard and is used by Android’s major mobile Linux competitors, MeeGo and WebOS. It wouldn’t be easy, though. Due to architectural differences between Bionic and glibc, thousands of Android components would have to be rewritten and rebuilt by Google and third parties. In some cases that could prove very difficult and time-consuming. There would also be significant compatibility issues with legacy versions of Android. Painful as it may be, there's no legally safe alternative that would shield Android from the implications of GPL copyleft. look more closely into what Google should do to fix this problem -- sooner rather than later. "This header was automatically generated from a Linux kernel header of the same name, to make information necessary for userspace to call into the kernel available to libc. It contains only constants, structures, and macros generated from the original header, and thus, contains no copyrightable information." Note that the text mentions libc, which is a different library than glibc. It's BSD-licensed. Bionic is based on libc, and the header files with the above notice are added to Bionic. The above notice is Google's way to say that the GPL doesn't affect Android because copyleft legally depends on copyright to be enforceable. Having looked at many of those files, I don't think Google is right. There are potentially copyrightable elements in those files, such as inline functions, and even a collection of individually non-copyrightable elements can as a whole be protected by copyright. "In short: you do _NOT_ have the right to use a kernel header file (or any other part of the kernel sources), unless that use results in a GPL'd program." BUT YOU CAN NOT USE THE KERNEL HEADER FILES TO CREATE NON-GPL'D BINARIES. That statement was made in 2003 and looks abundantly clear. I don't think it was based on the assumption that cutting out source code comments and some functions, with the subtlety of a chain saw, would ever be sufficient to circumvent the GPL. If this served its purpose, the GPL would be reduced to absurdity, resulting in proprietary forks and extensions of Linux and other GPL'd software such as MySQL. Neither Linus nor I are lawyers. However, two high-profile US copyright experts -- an academic and a practitioner -- have also expressed doubts about Google's claims. Professor Raymond Nimmer stated on his blog that "[t]he Linux core header files [...] are almost certainly copyrighted" and while he points out that he hasn't examined the facts, he finds a removal of "the expressive features involved in the structure of the header files [...] difficult to achieve since the goal was to borrow the effectiveness of the Linux system at least in part." But the presence of expressive features would make the output of the script copyrightable, and consequently it would have to be published under the GPL. "Google's position is a bold assault on copyright protection for software and source code. There are cases, to be sure, that have permitted some copying of very small snippets of code when that is necessary to achieve interoperability. [...] Those cases do not provide much support for Google's argument that copyright law allows it to copy entire source code files, and even less for its suggestion that entire APIs [application programming interfaces] are not copyrightable." In summary, Naughton argues that Google is very likely violating the GPL with Bionic because it incorrectly assumed it can simply "clean" the Linux headers of copyrightable information and repurpose them as it wants. On a "micro" (or individual file) level, he explains that most legal experts recognize that header files can contain copyrightable material. He points out that some, if not many, of the Linux headers that Google used in Bionic do indeed contain copyrightable material and that despite Google's claim to the contrary, it did not (and probably cannot) fully remove that material. As a result -- he concludes -- there are very likely files in Bionic that are still subject to the GPLv2. He also makes an argument at the "macro" level based on the fact that, under US copyright law, API files are copyrightable. He argues that the overall collection of over 700 headers would likely qualify for copyright protection as a whole based on their "complex overarching structure." That would, therefore, preclude Google's ability to take those files as a group and strip them of their GPLv2 license. Naughton's argument regarding the Bionic headers is straightforward, and I recommend reading it in full because I believe it explains very well what Google has done in a technical and legal sense. While I am not a copyright lawyer, I think the argument is compelling, and bears examining by those who are looking to use Android commercially. In light of what experts like Nimmer and Naughton say, at the very least, I don't think anyone in the Android ecosystem can rely on Google's "no copyrightable information" claim. For a platform like Android, on which so many products depend, there has to be legal certainty. Anything less wouldn't do. The header file issue described herein affects many thousands of files (it pervades the Android codebase), and there are thousands of contributors to the Linux kernel -- independent programmers as well as companies -- who could sue Google and other companies in the Android ecosystem, alleging a violation of the GPL. Litigants could have all sorts of motivations, be it the defense of software freedom, hopes of lucrative settlements, or competitive conflicts with Google, certain device makers, or particular application developers. Someone might act next month, next year, or later on. If a court of law finds that the Bionic library indeed contains copyrightable GPL'd software, the distribution of all software compiled against Bionic -- and of devices containing such software -- will have to stop until there is full compliance with the GPL. Bionic is at the heart, not at the periphery, of the Android architecture. Thousands of Android software components depend on it. I have discussed this with a Linux programmer I trust and he generated an automated analysis for me that I have uploaded to Scribd and Crocodoc. The document contains a table that shows Android components that have a so-called file dependency on Bionic, meaning they can't run without Bionic. It shows which particular parts of Bionic are used, and how many times. That table has 1,276 pages and more than 27,000 rows, and isn't even complete because only the open source components of Android were analyzed. In the event of a court ordering an injunction due to GPL infringement, the distribution of Android could not resume until each and every one of those rows -- and similar dependencies in files not yet examined -- has been properly addressed. In terms of third-party applications, the more powerful and sophisticated they are, the more likely they are to be written in C or C++, and, therefore, the more likely they are to use Bionic. When device makers add their own components (for example, Motorola adds a program named Motoblur on top of Android), they will in most cases use C or C++ as the programming language, and consequently the Bionic libary. Major third-party apps like Angry Birds and the Adobe Flash Player also appear to be written in C or C++. Theoretically -- but not practically -- Google could try to solve the problem by giving up on its mixed-source strategy in favor of a GPL-only approach. Proponents of free software would be very happy about that. In fact, some of them have already started the ambitious IcedRobot project to build a GPL-only Android fork. But the price for Google to pay for this would be prohibitive. For many components of Android, Google owns the copyrights, so it could relicense them under the GPL. However, for some very essential code Google doesn't have that option. In particular, its Dalvik virtual machine includes code from the Apache Harmony project. The Apache license and the GPL are inherently incompatible. Without that virtual machine, Google couldn't make most Android apps run. It would therefore have to replace the Harmony code with something already available or potentially relicensable under the GPL. This might take too long. Even if Google -- hypothetically speaking -- managed to put all of the essential code under the GPL, it would thereby abandon the commercial strategy it has been pursuing so far, at least to a very large extent. On the current basis, Google uses proprietary licensing terms for closed source apps such as Google Earth -- in addition to its control over the Android trademark -- to control what device makers do. If those components had to be GPL'd, what Google would be left with to control the ecosystem would basically come down to the Android trademark. Device makers would, as I explained further above, find themselves unable to differentiate their products through proprietary add-ons. They might invest a lot of money in extensions like Motorola's Motoblur only to find their competitors -- such as low-cost manufacturers from China -- building such code into competing products on free software terms. That's the death of differentiation. Developers of applications using Bionic would only be able to charge (via the Android Market) those customers who don't know what rights they have under the GPL. All others would find ways to download and install those apps on GPL terms, i.e., free of charge. In view of all of that, I think the only viable option will be for Google to recognize its error with Bionic and to replace it as soon as possible with glibc (GNU C library). That library is licensed under the LGPL ("Lesser GPL"), which has the effect that applications can access the Linux kernel without necessarily being subjected to copyleft if certain criteria are fulfilled. Using glibc is the industry-standard approach, and it is the approach used by those in the open source world who are trying to "play by the rules." As I said before, even Google's major mobile Linux competitors use glibc. I have found documents that prove this: a MeeGo technical overview, a webOS license information document (Palm was acquired by HP), and a blog post by a sr. webOS developer relations engineer. In fact, Google's decision to forego glibc is one of the reasons Android is considered a Linux fork rather than a true Linux implementation. However, it's apparent that even the LGPL'd glibc is too much of a copyleft risk from Google's point of view, so Google decided to build Bionic in the dubious way I described herein, essentially going its own way and thumbing its nose at the industry convention. But replacing all references to Bionic with references to glibc throughout the entire Android codebase would be a daunting task. There wouldn't be the licensing issue Google would face if it wanted to put Dalvik under the GPL, but probably a large number of manual edits would be needed in many of those countless Android files making use of Bionic. Some files might just recompile right away against glibc, but I doubt that all of them would. I understand that there are important architectural differences. This replacement would have to take place not only on Google's part but also be required of all developers of Android add-ons and applications written in C/C++, and by now a lot of such software has been developed by a large number of companies. Moreover, even if Google could resolve these issues going forward, there would still be problems with products running legacy versions of Android. Nonetheless, Google needs to do something because the sooner Google gets its act together, the more likely it is to pre-empt GPL enforcement by any Linux kernel copyright holder. I'm sure Google would rather spend the same resources on the development of new features for future Android versions. That's what the ecosystem -- of which I'm actually a part, as a user -- would also like to see happen. But what must be done must be done. Continuing on the current, highly hazardous basis is not a viable option as far as I can see. In the age of e-commerce and software patents, even a company like Victoria's Secret has the pleasure of defending itself in more than one patent dispute at the same time. A couple of weeks ago I reported on unlikely bedfellows Microsoft and Google suing GeoTag, a company that has sued 397 companies over a geotagging patent. Victoria's Secret is #378 on that list. And now it has been sued, alongside Apple and PayPal, over a one-click checkout patent. The lawsuit was filed yesterday with the US District Court for the District of Delaware (case number 1:11-cv-00222) by Delaware-based Efficient Online Purchasing LLC and Washington state-based Cordance Corporation. I haven't been able to find out anything about Efficient Online Purchasing LLC. Its role is described in the complaint as "exclusive licensee". It could be that Cordance, or someone close to Cordance, set up that company to have a Delaware-based entity for the purpose of litigating in that district. Cordance itself has previously made headlines through a patent dispute with Amazon.com. That battle started in 2006 and was considered "ironic" against the backdrop of Amazon's own history of enforcing its one-click patent against Barnes & Noble and other companies. Amazon obtained a jury verdict against Cordance in the same district court, but the judge decided differently ("as a matter of law"), and now the Court of Appeals for the Federal Circuit (CAFC) is looking at a certain aspect of the federal court's decision. "This application is Continuation of prior application Ser. No 09/570,675, filed on May 15, 2000, now U.S. Pat. No. 6,345,288 Allowed, which is a Continuation of application Ser. No. 09/143,888, filed on Aug. 31, 1998, now U.S. Pat. No. 6,088,717, which is a Continuation of application Ser. No. 08/722,314, filed Sep. 27, 1996, now U.S. Pat. No. 5,862,325, which is a Continuation-in-Part of application Ser. No. 08/609,115, filed on Feb. 29, 1996 now U.S. Pat. No. 6,044,205." The short version is that the great-great-grandfather of the current patent goes back to February 1996, and due to the way continuations of patents work, this ancestry has implications for, among other things, the search for prior art that might be used to have this patent invalidated. Cordance, which describes itself on its corporate website as "the pioneering developer and provider of digital addressing technology" (but the latest press release on its website was issued in 2006), was previously named OneName Corporation. The patent was assigned to the company under that name. Cordance wants an injunction against and compensatory damages from all defendants. In Apple's case, Cordance claims that infringement is willful and asks for treble damages. The complaint doesn't explain why Cordance believes that Apple knew about the patent, but there may have been some contact between those companies at some point. I'm sure that Cordance believes it has rights against many other e-commerce companies. After taking on Amazon, it has now elected to sue Apple, PayPal and Victoria's Secret, but depending on how the lawsuit goes, it won't stop there. Cordance and its "exclusive licensee" may already be trying to collect royalties from other companies. Finally, a very interesting detail: the "inventor" of the asserted patent, Drummond Reed, serves as Cordance's chief technology officer, and his bio on the Management Team page of the corporate website mentions that he "led the effort to contribute [certain] patents to XDI.org so they could become open, public, royalty-free standards. XDI.org subsequently contributed this intellectual property to OASIS where Drummond serves as co-chair of the XRI (Extensible Resource Identifier) Technical Committee with Gabe Wachob, Chief Systems Architect, Visa International, and co-chair of the XDI (XRI Data Interchange) Technical Committee with Geoffrey Strongin, Platform Security Architect, AMD." Sounds like a benefactor of humanity. So why doesn't he just offer that one-click checkout patent as an open, public, royalty-free standard to Apple, PayPal, Victoria's Secret, and Amazon.com?